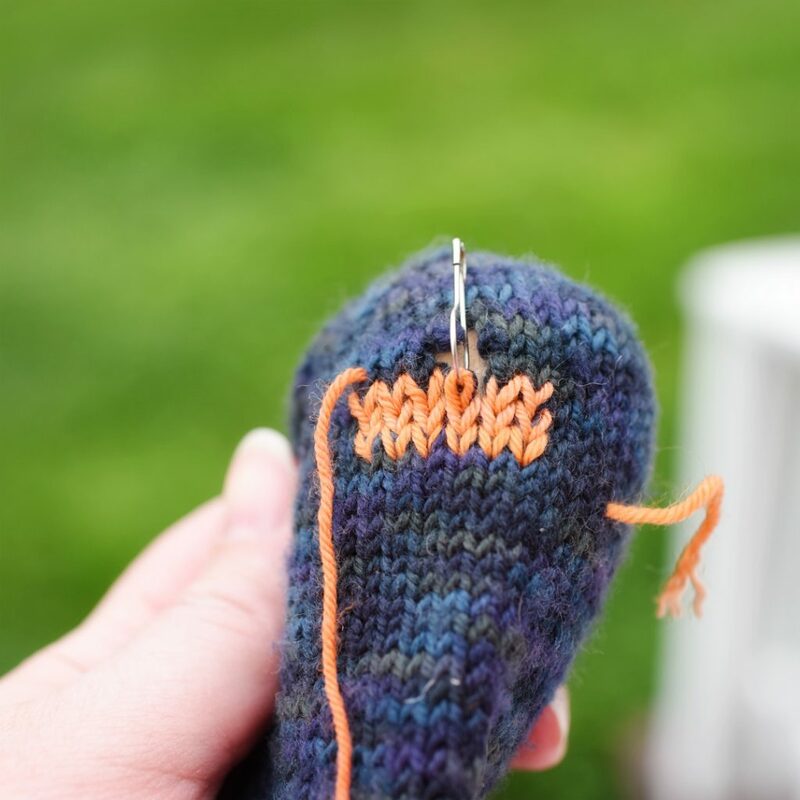 I started by securing the freestanding stitch with one of my very favorite safety pins/stitch markers. The strand that broke is directly above this stitch. 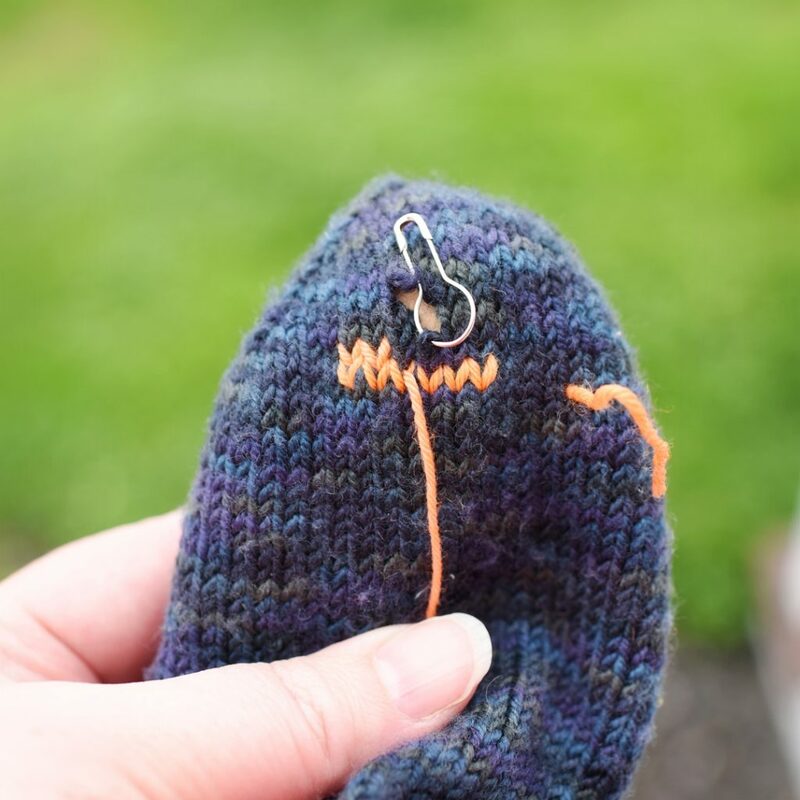 The safety pin keeps the dangling stitch from running down any farther and makes it easier to recreate the fabric around and over the hole. Then I moved out a few rows below and to the side of the hole (when in doubt go bigger) and started duplicate stitching over the existing fabric. 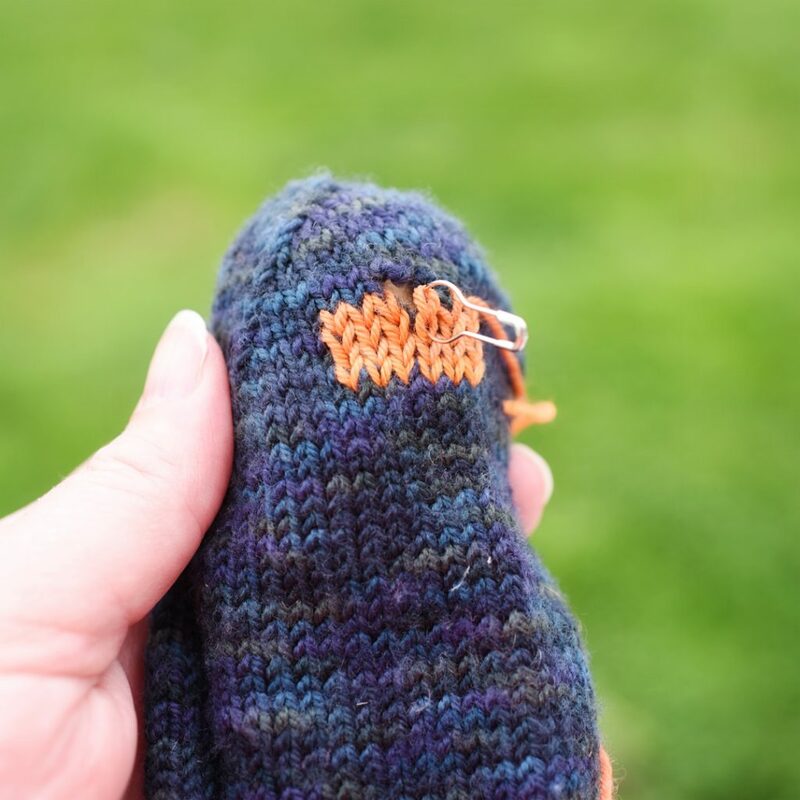 When I got to the row with the pinned stitch, I kept on duplicate stitching, just following the path of the existing yarn like I had been all along. That meant going right through the pin. The pin helps make the new stitch the right size and keeps the damaged fabric stabilized while I’m working. On the row where the broken stitch means there’s actually missing fabric, I used the outside edge of the pin as a guide. I just wraped the yarn around it to make the missing stitch. This is the only spot where I was actually creating totally new fabric (instead of tracing the path of existing fabric). 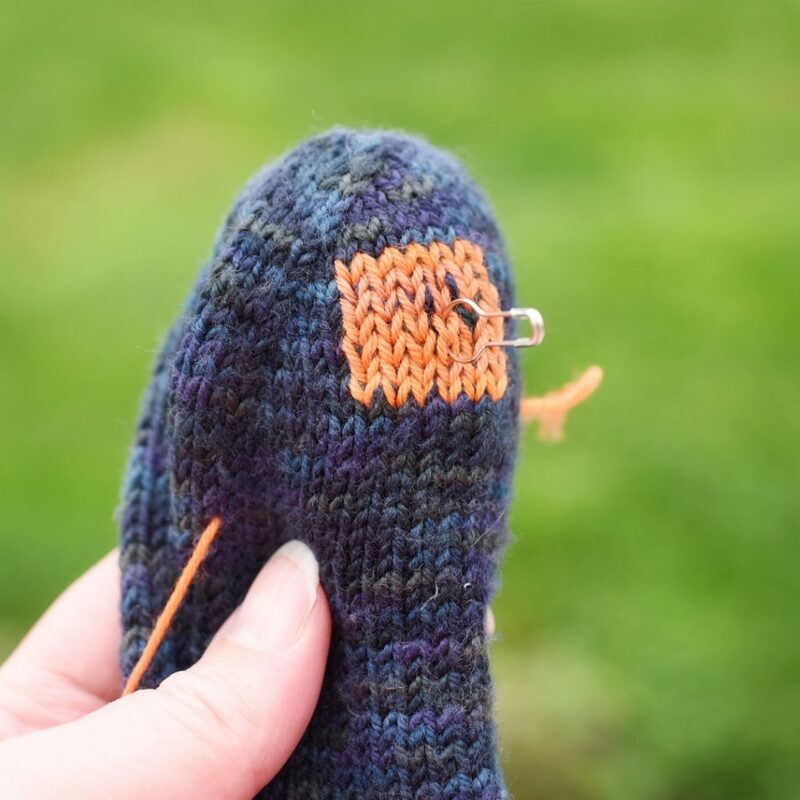 It’s easy enough when you’re only dealing with one stitch, but if there were more, I’d use one pin per column of bad stitches (and it does get trickier if there are lots of missing stitches…though it can be done). Once I was past the hole, I just did a few more rows to finish it off and called it good. The pin stayed in the same place the whole time and made it much easier to line up the stitches where the underlying thread was gone (and kept the hole from getting bigger as I tugged on the surrounding fabric as I worked). If this had been a hole caused by wear I would have used thicker yarn and made a bigger patch. But since this is just a snapped strand, this should take care of stabilizing it and make the socks fine for many more wearings. The whole thing took about fifteen minutes (and would have taken less if I’d not been taking pictures), which seems like a fine investment to keep using something that probably took twenty hours to make in the first place. Wow! That DOES sound simple enough! Thanks for the tip! I love this! Thank you for such clear guidance and images Hunter! I have the same problem in the first sock I made and I’ve been trying to figure out a solution. Thanks for the great pictures documenting your method! I’m excited to fix my sock now. Thank you so much for this tutorial! 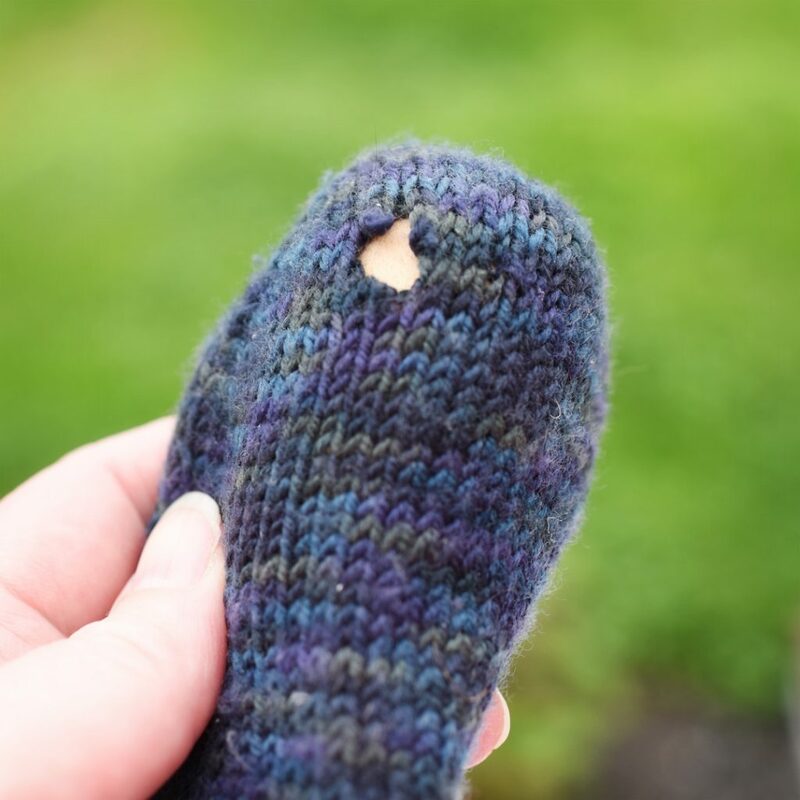 I have three sweaters (one a rugged wool, two dressy cashmere) that have tiny holes (one from a bracelet, two from moths) and I have been avoiding wearing them in case it makes the holes worse. After seeing this post, I have successfully mended one, and the other two are waiting, but I am now confident I can mend them so that they still look nice! Thank you so much!